If you didn't know it already, the Northern Lights aren't the only aurora out there. That's right – the famous neon beauties can be chased south of the equator, too. Fortunately, some of the best places to see the Southern Lights are accessible to get to, and are easy to incorporate into intriguing travel plans. Also known as the Aurora Australis, the Southern Lights occur when solar particles collide with atmospheric gases and become excited. The result is a brilliantly glowing light show, which can last for several minutes or even days. The colours range based on what the particles collide with, resulting in hues of red, green, yellow, violet, or blue. What is the best time to see the Southern Lights? The Southern Lights are best viewed on dark, clear nights. Winter is generally best since the nights are longer. In the Southern Hemisphere, that is generally between March to September. That said, aurora are unpredictable and sporadic. Aurora activity can be monitored by watching alert sites and Facebook pages (we've included region specific ones for each country below). Remember to also escape the city lights when you can, as the night sky is more easily viewed without light pollution. Photographing aurora (or the night sky in general) can be a challenge, review the tips in this post beforehand. The Southern Lights are visible in certain countries in the southern hemisphere. There are fewer regions to see them compared to the Northern Lights, but that makes chasing (and witnessing) them that much more special. Wherever you are, be sure to escape the city lights, as light pollution makes it harder to see the night sky. So, if you're keen to get off the tourist trail and witness one of nature's best displays, here are the best places to see the Southern Lights! Psst: if chasing the Aurora Borealis is also on your bucket list, check out our Northern Lights guide! 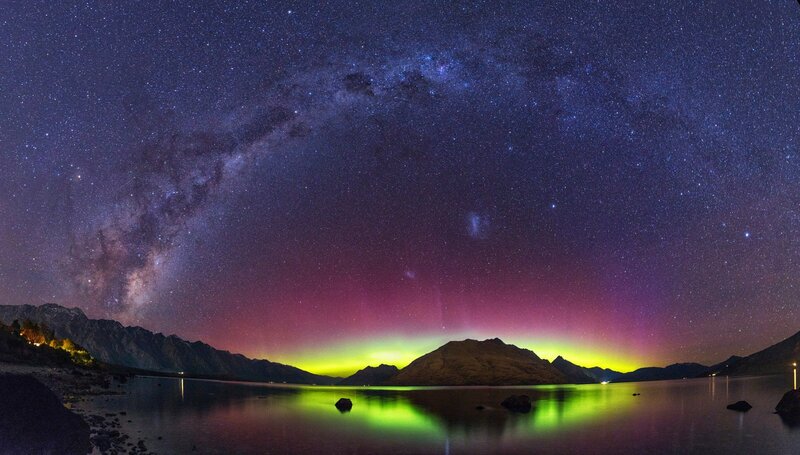 New Zealand is one of the best places to witness the Southern Lights. Its southerly location combined with the minimal light pollution makes it ideal for an aurora-inspired trip. Not to mention, there is abundant natural beauty that begs exploring, too! If planning a visit here, be sure to check our New Zealand travel guide. 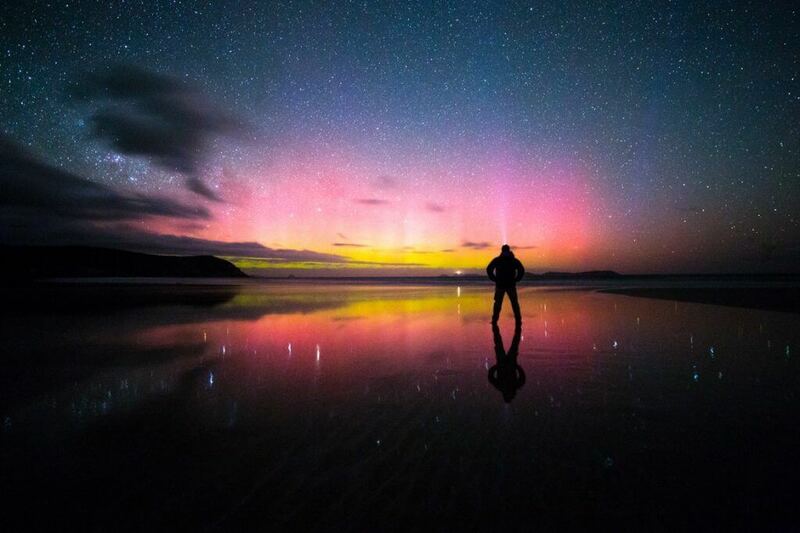 Where: The Southern Island has many hotspots for aurora spotting, including Stewart Island, Lake Tekapo, Dunedin, Invercargill, The Catlins, Queenstown, and Christchurch. How: Go camping or stay in a remote AirBNB cabin or lodge. Roadtripping in a car or campervan is ideal. You could also try your luck on a stargazing tour during high solar storm activity. Getting there: Queenstown is generally the cheapest city to fly into on the Southern Island (and Auckland on the North). Search Skyscanner by entire month for the best prices. Gleaming white sand beaches, hopping wallabies (mini kangaroos! ), and some of the purest air on earth, Tasmania is one of the most underrated parts of Australia. This is as far south as one can get in Australia, and provides optimal odds for aurora activity. It's surprisingly affordable to get to from the mainland. Even if you don't spot the aurora, the pristine nature and adorable wildlife here are worth the trek. Where: Nearly all of Tassie is good for aurora spotting. Look for unobstructed views facing south. The Southern Peninsula (south of Hobart), Mount Nelson, Mount Wellington, Rosny Hill, Seven Mile, are just a few ideas. How: Camping, campervan, road tripping, or in a tucked away AirBNB cabin or lodge. If aurora forecasts are high, try booking a stargazing tour. Getting there: Hobart is the largest city, followed by Launceston. Budget airlines like Jetstar and Tiger fly here. Search Skyscanner by entire month for the best prices. Resources: Realtime sightings/alerts in Aurora Australis Tasmania Facebook group. 400 miles off the coast from Argentina, this small group of islands is home to penguins, elephant seals, and aurora. Snowcapped peaks and stretches of white sand beaches speckled the island. In spite of its isolation, the Falklands are swiftly attracting tourists who are lured by its jaw-dropping scenery and wildlife. Where: All parts of these southerly islands are ideal for aurora spotting. When: During the darkest months, April-August. How: Simply step outside! Accommodation can be booked ahead online. Getting there: Fly into Port Stanley Airport (PSY), accessible from Argentina. Search Skyscanner by entire month for the best prices. Graciously untouched, Antarctica is swiftly attracting travellers. The eerily barren landscapes are home to turquoise glaciers, waddling penguins, and stunning snowy hills. Truly, this part of the world looks, well, otherworldly. It is a major cost and effort to get here, but it is undeniably a once in a lifetime experience. Where: You'll be restricted to the locations of your cruise/tour, but aurora can occur anywhere. When: Antarctic winter runs from March – September, but cruises tend to only run from November to March due to severe weather. Thus, March is your best odds. How: From the deck of your boat cruise. Getting there: Antarctica cruises depart from Argentina (Ushuaia), Chile (Valparaiso and Punta Arenas), Uruguay (Montevideo), Australia and New Zealand. 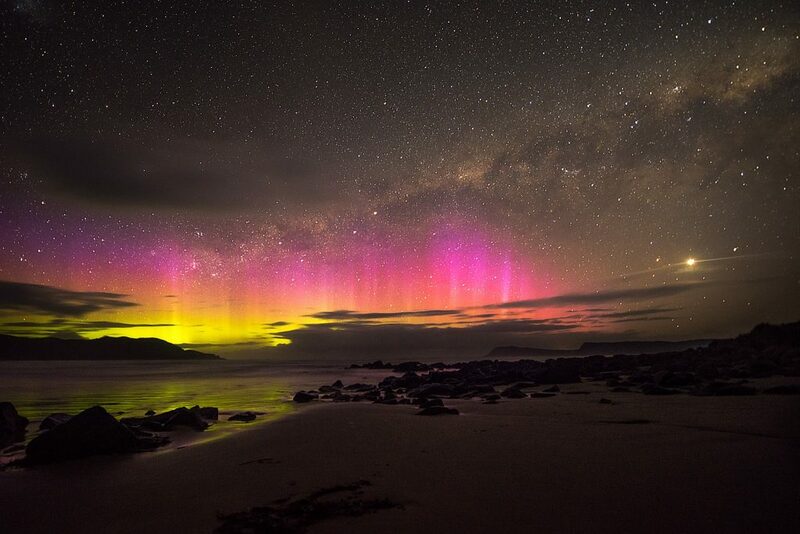 Aurora over Wilsons Promontory, Victoria. Photo permissions from Gippsland Images. Stretches of open spaces and sparkling coastline, this southerly Aussie state is another scenic aurora viewing spot. Best viewed by the ocean if able, the aurora here create a neon reflection on any open stretches of water. Stunning lookouts and hikes abound in Victoria, with some of the highlights including Wilsons Promontory, the Twelve Apostles, and the Mornington Peninsula. Where: As far south as possible. The coastline is ideal if timing is suitable. When: During winter, March – September. How: Be away from the city lights during high aurora activity. Camping, road-tripping by car, RV or campervan is fun and flexible. Alternatively, camp out in a remote AirBNB cabin or lodge. Getting there: Drive from anywhere mainland Australia or fly to a major Victorian city such as Melbourne. Budget airlines abound in Australia. Search Skyscanner by entire month for the best prices. Resources: There is an Victoria-based Aurora Facebook page and website. One of the southernmost island's on earth, South Georgia is beautifully barren. Like much of Antarctica, there are no permanent residents here, save for its quirky elephant seals and penguins. White snowcapped peaks contrast against brilliantly blue glaciers; this place is a feast for the eyes, especially if you can spot aurora. Where: Anywhere in the vicinity of the island. When: Antarctic winter (March – September), though cruises only visit during optimal season. March is ideal for best odds of aurora viewing. How: Spottable from your cruise deck. Getting there: Only accessible by cruise ship. Cruises depart from Chile, Argentina, or Uruguay. South Georgia Island is also included as a destination in many of the Antarctica cruises. Resources: Lonely Planet is a good resource on travelling this region. Ushuaia is the southernmost city on earth, cradled by neighbouring mountains and cooled by arctic waters below. Fair warning, the ever-changing weather here makes it trickier to witness the aurora compared to other spots on this list. When they do occur though, it is magnificent. A visit to this region is easily paired with a venture through Patagonia and/or Antarctica. Check our South America flight guide for tips. Where: Away from the city lights. How: There are plentiful accommodation options, from AirBNB to affordable hostels and hotels. If aurora activity is high, you could try your luck on a nighttime snowmobiling tour to witness them in the great outdoors. Resources: Check the Aurora Australis alerts website for realtime updates. While its northern counterparts are more readily known by travellers, the Southern Lights are equally as delightful. In fact, with far lesser crowds after them, we'd argue they may even be better. So the next time you're south of the globe, check if it's aurora season. You could just get lucky!